Shannon Carney and Dave Pschirer are no strangers to 24 Foundation. Founders of now-beneficiary Wind River Cancer Wellness Retreats & Programs, Shannon and Dave first found their home on the Loop in June 2003. That summer, Shannon was in the middle of chemotherapy for breast cancer. Dave spotted an ad for 24 Hours of Booty, and they decided to register with a group of friends. As Shannon remembers it, “I was bald and only able to bike a single lap at a time. After each lap, I would roll into the parking lot, take off my helmet and take a nap.” At the end of those 24 hours, Shannon had completed 7 laps around the Loop. Since that year, Shannon and Dave have participated in 24 Hours of Booty as fundraisers, volunteers, and now a beneficiary. 2003 was also the year that Shannon received her cancer diagnosis at age 37. “In an instant, our lives changed,” Dave remembers. “we spent the next year going to appointments, enduring hospital stays and dealing with challenging side effects from chemotherapy, surgery and radiation treatments. The medical community took charge of the cancer, but we were left to our own to figure out how to deal with the fatigue, exhaustion and emotional stress that come with living with cancer.” Even though Shannon was the patient, both of their lives changed as they walked together, every step of the way. 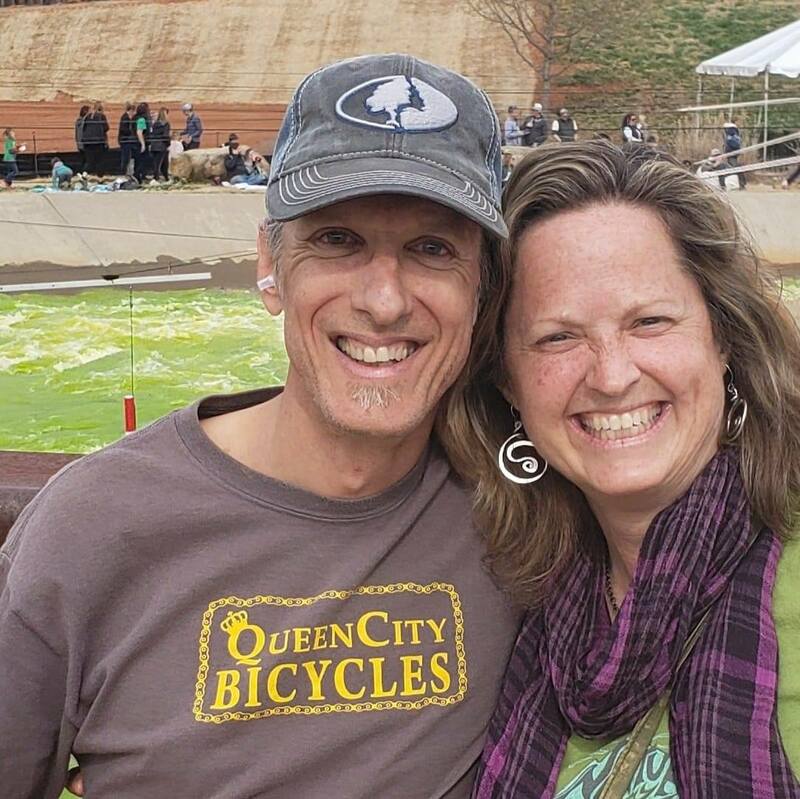 She received her chemo in 3 week cycles, and during her handful of good days each cycle, Dave and Shannon would get outside, go to the mountain, ride bikes, travel. Anything to feel like they were living. Additionally, every Sunday night before her next round of treatment, they would host “chemo parties” with friends, in an effort to maintain normalcy. In 2004, Dave and Shannon re-entered the careers as a lawyer and engineer, thinking they could go back to the way things had been before cancer. As it turns out, re-entry wasn’t quite that simple. ” The problem was that after our experience with cancer together, we were not the same people we had been before,” they recall now. They had to face the reality that the wake of turbulence that came AFTER treatments was just as critical, and the couple soon realized they needed to align their work with their personal values and a stress-minimizing new routine. Shannon remembers a Friday afternoon in July 2005. “I came home from work emotionally exhausted and in tears… again. Dave looked at me and said simply, ‘don’t go back on Monday.’ That afternoon we sat on the floor with a big poster board and, for the first time in our relationship, began to write down what we wanted more of in our lives and what we wanted ‘less of’ in our lives.” That exercise would soon prove to be the springboard and filter for a new path in their lives. 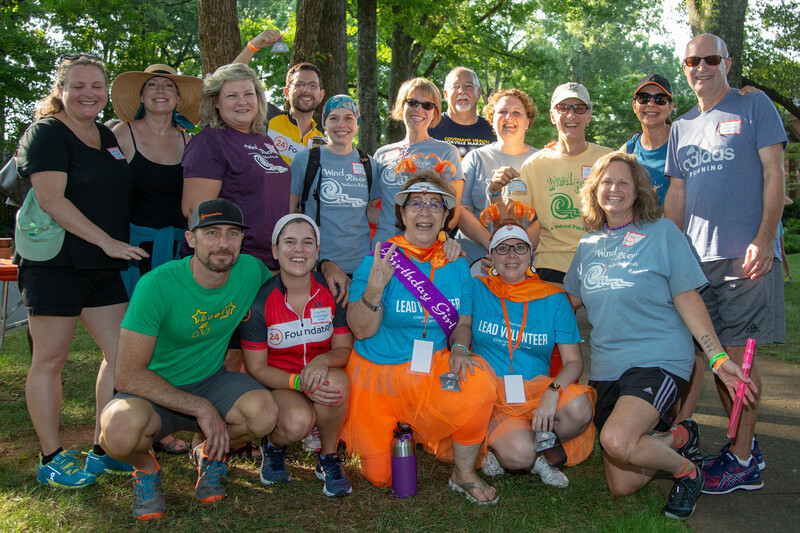 11 months to the day, Dave and Shannon had bought a home in the woods 90 minutes from Charlotte, left their corporate jobs and decided to live life on their own terms based on their shared values of compassion, support of others with cancer. “We knew the property would be the perfect sort of environment to bring people into to relax. We folded in many of the lessons we learned on our journey and began imagining a safe place in the woods where survivors could bond, learn a variety of techniques for self care and anxiety reduction and have fun,” Shannon reflects. Now, that property, Wind River, does just that, providing survivors and their caregivers with a vital sanctuary. This summer will mark the 16th anniversary of Shannon’s debut lap around the Loop. She’s no longer bald, no longer needs to nap after each lap, but Shannon and Dave still exude the optimism and hope they carried in 2003. Only now, they alongside the Wind River team, have the joy of sharing their mission far and wide.